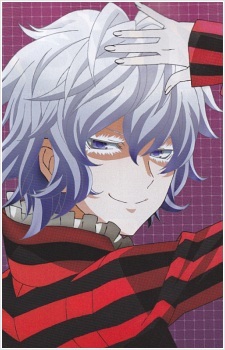 Ureu Mono "Anguished One, Alcor, Al Saiduq"
The Anguished One is a major character that appears in Devil Survivor 2. The Anguished One has curly white hair and a very pale complexion. He is always squinting, giving him a sleepy appearance and white make-up/eyelashes around his eyes. He wears a red and black striped shirt with a frilled undershirt, having a design similar to the ship possessed by Alioth, along with matching shoes and black pants. In Devil Survivor 2 The Animation character model, his shoes' pattern is different from original design. While in original design his shoes has the same pattern as his cloth, in anime character model the shoes are coloured half-black and half-red with the half-black part located nearer to middle side of his body. His true form as a Septentrione takes the appearance of a cube with red and black stripes not unlike his shirt, encased in a blue frame. When he shifts into a different form, it resembles a crystal with the same red and black striped pattern, with wires wrapped around the middle. He has a strange fascination with people. Although he has a very sinister appearance, and his motives can come across as evil, he is actually a very kind person. The Anguished One is very fond of the protagonist to the point where he takes everything he says seriously, even if it is obvious to other people that the protagonist is joking.